Last edited by JamesJMH91 on Sat Mar 31, 2018 12:08 am, edited 1 time in total. David: AN ACT OF GOD! Matty: [mutters] I feel sick. I watched Eunice's game a few months ago on Yew Toob. She was a character and a half, wouldn't surprise me if she's still going now. The key there being, 'so far'...but, hey, he took it well. The atmosphere at the end of Matty's game was extraordinary, almost unprecedented at the time. i think it was the first time since 1p Trevor where the atmosphere was totally dead at the end, with the eerie silence in the studio, Matty's wife in tears and Matty looking as if he was about to hang himself after the game collapsed. It was so bad that when Matty no-dealt the final offer of 11p, there wasn't even the usual 'polite applause' like there was when Trevor, near tears and barely able to speak, no dealt his final offer, it was just complete silenece. i'd never seen the atmosphere so dead before! Derek Brown's game was, of course, completely usurped by Nikki a few months later, which saw it pale into comparison despite being a hallmark trainwreck at the time. An entire hall of fame wing was to be set aside for his game alone. Nowadays, especially in the wake of the international monstrosity that was Mark de Souza's 2012 game, it doesn't look all *that* unlucky. I do recall that it was notable at the time for producing the first blue 'squashdown', which feels rather late for such a relatively easy achievement. Matty, well, he may well have looked like he was in the process of buying the farm, but he appeared all chipper in the '1p club' audience during the Banker's birthday week not long after... maybe about three weeks or so in recording time. Christ, commenting on decade old game shows at this time. I remember the ending, it was just silent and painful. I don't know whether to feel sorry for him or to say he was arrogant. Let's fast-forward a year to 2009, when things were not quite the show's heyday of 2006, but still far more positive than 2008 (and luckier for that matter!). Around this time in 09, we had 97 year old Joe (unlikely he's still around though ), Lovely Lisa play the 1000th show and won £50k but missed out on the £250k, the 1000th show celebrations where the £1,000 was replaced by a large cash prize and the first of only 2 all-blue 8-boxes which shocking went over everyone head at the time!! the first of only 2 all-blue 8-boxes which shocking went over everyone head at the time!! Not too sure it did, it did make waves at the time to the extent that I even had vague knowledge of such an event taking place, and this was during my wilderness years of paying any sort of attention to the show. It was Noel who forgot about it immediately, bless his cotton beard. The reveal of the final red in that game is a memorable moment, though. There's an absolute *shriek* from the audience and befuddled faces all around - especially as there were two former 'statsman' contestants present, who knew just how unlikely taking out the last three reds were... and it happened before their eyes in a landmark week. I put the video online somewhere... if you find it, you're a better man than me. It actually feels a bit funny not having Easter on the weekend of April 7/8 this year, as the last 2 years (2012 and 2007) that have had April 7/8 on a weekend, have had Easter fall on that weekend! April 2011 started well with £20k Paul and £46k Sophie's games but then hit rock bottom again with the middle part seeing the first ever run of FOUR consecutive blue wins. Things continued to struggle for the rest of the month, but that would all change when May rolled around! 11 years ago, Jamie dealt at £28k on a 5-box board that was remarkably similar to £26,400 Miles a few days earlier with 2-blues/£20k/£50k/£75k at 5-box, and had an OPW when he found the highest 2 and had £20k on the table just as Miles did!! Ah, but I bet there hasn't been a blue win on 22 April since at least 2016! So it's been 12 years since Massimo and the 'boxgate' incident where Clumsy Tom accidentally knocked his box and revealed what was inside it, resulting in ALL remaining unopened boxes to be removed and reshuffled! Also, 11 years ago, is another long forgotten event that you could say is overshadowed by the events happening around this time in 2006 - Kath had a £10k OPW after dealing on a '4 lowest reds/£50k' final 5 following an extraordinary week of third offer deals (All of which were reasonable deals unjustly punished by a mixture of large numbers on the table and stupidly inflated proveout offers), which was good. But it was also Kath/Roy's game that had the full wing lineup from the Catherine Tate special where Nan played and dealt at £199 at the first offer after losing the top 5 in the first 5 boxes! Speaking of contestants called Roy, 5 years ago was another Roy who had a classic game where he became the first and only contestant to win £100,000 by dealing! . What a contrast to his 2007 namesake who also played on the last Monday of April and dealt at £49 after smiling through a trainwreck game - His speech when he dealt at the £49 offer was truly unforgettable! So it's 11 years today since £75k Daniel's game, arguably the strongest game of all time as he kept all the power 5 until 6-box (!!) and being faced with a £750/£50k/£75k/£100k/£250k, was offered a phenomenal £90,000 - which he declined! In the first box, the £750 came out and the studio went wild as Daniel was faced with the top 4 at 4-box - the best board anyone could possibly have at that stage of the game!! 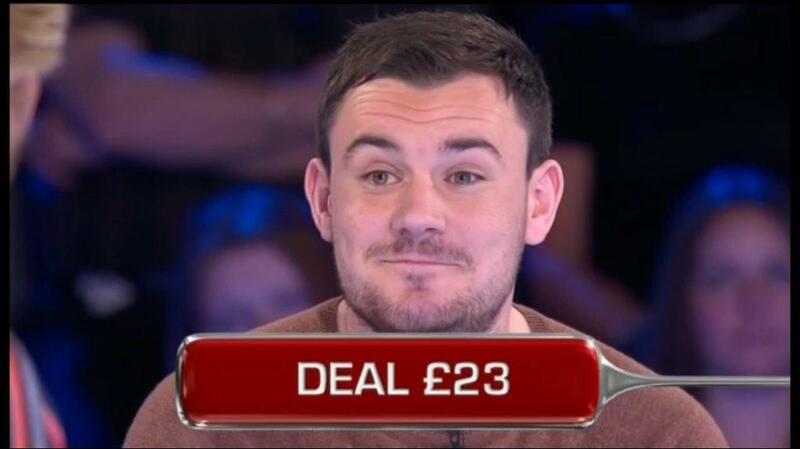 He almost pulled off the first ever dream finish but unfortunately found the £250k in the last box Still, it was hard to believe people were disappointed about being in active play on a £50k/£100k, and Daniel DEALT at the final offer of £75,000, with £50k in his box! I'm still torn whether Daniel or Brenda had the strongest 5-box ever, as Daniel had the top-4 but still had one blue but Brenda (although she did deal a round earlier) was guaranteed £10,000 at 5-box and had all the power-5 except £100k. Other contenders for the strongest 5-box board ever were £75k Amy (dealt on one of only TWO 5-box boards in the history of the show that had £15k guaranteed) and £1k Esher who had £1k/£35k/£75k/£100k/£250k at 5-box but had one of the most dramatic crashes after she played to the end, swapped away £75k and won £1,000! Without question the strongest 5 box was Daniel's (both in terms of the Fair Deal and Mean) and the strongest £100k-high 5 box was Colleen's. Given the Banker's behavior at the time, I'd dread to think what the offer would've been had the £750 stayed to the end in Daniel's game, but in most cases the Banker would have to make a generous offer in that situation after turning down a mammoth 5 box offer. For instance, Esher was offered £28,000 on a £1k/£75k finish after facing a similarly strong 5 box, and Bill would've been offered £26,000 on a £100/£75k finish had be turned down his £80,000 button offer. The proveouts didn't start well, as the fifth offer would've been £44,400 and the final offer would've been a forcing £4,400 on a 10p/£35k finish, but Stephen got the last laugh as he had 10p in his box. That 10p was a bit of a troublesome amount during the "Battle of the sexes"! A bit late for this, but 4 years and 3 days ago was Jack's game, who was the pretty much the last controversial character by fandom before fandom declined to the point that they didn't really care much about the players. People on Digital Spy pretty much tore him to shreds for providing such ridiculous and useless advice (ie his "stats" of what boxes contained the last few games and him going him going from encouraging a player to decline a reasoanble £40,000 offer to encouraging to player to Deal a lousy £6,000 offer in the space of one game ), and I thought very similarly to them. In fact, I had a lot of strong words for him in his game thread, to the point that I had to edit all of my posts after the game ended so that I wasn't at risk of being banned. Of course, being such a controversial character on an Endemol game show gave him an easy invite to be on Big Brother the next year. I can remember Jack looking like he was about 14! Surprisingly, he was the first "young" person named Jack to appear on the show as the previous 3 Jacks were all old(er) men! Of course, as i mentioned, the month of September has always been the player's kryptonite for much of the show's history. 10 years ago, we were in one of the all-time worst peroids for the show - the first 3 weeks of Season 4 which was endless blue wins (apart from Mike's 11-box deal which backfired) that were all ludicrously covered up by post-game handouts, and the offers were getting so bad that most players had no decisions until at least 5-box!